Be careful with adding a handkerchief to your outfit. Elegance should stand out on its own. I see a lot more men today wearing pocket handkerchiefs with their jackets. And as much as I like being different to the rest, this is certainly a good thing. Whether a plain, white linen square or a coloured silk puff, handkerchiefs are a great source of expression for men. The opportunities for decorating ourselves with colour are few; rarer still are those that involve bright hues or flighty silk. Most other aspects of fine clothing are subtler. The waisting of a jacket, the hang of a tie or the slim welt of a bespoke shoe are all things you would notice – but not immediately, not obviously. A handkerchief shouts in contrast: because it is an additional item, like a boutonniere, that most men wouldn’t normally wear; because it is often so bright, whether coloured or not. So the danger is that a clothing novice wears a pocket handkerchief to show he is interested in clothes, but the rest of his outfit betrays naivety. I saw a young man wearing one yesterday but his tie ended at his belly button, his jacket was undone and his shoes were far too pale for his suit. In that set-up the handkerchief only draws attention to the cheapness or ill-fitting nature of the other items one wears. I do hope that none of this sounds arrogant or puts off young men from trying out handkerchiefs. But as with the comments made by readers on my recent post regarding matching socks and accessories, this is experimentation for the experienced gentleman. For those that have already mastered the basics. Elegance is still essentially about simplicity. Make sure you match your socks to your trousers to start with. Then experiment later, keeping enough simplicity elsewhere in the outfit to retain balance. With handkerchiefs, only add one to an outfit when you are confident in everything else. Make it a latter stage in your education. 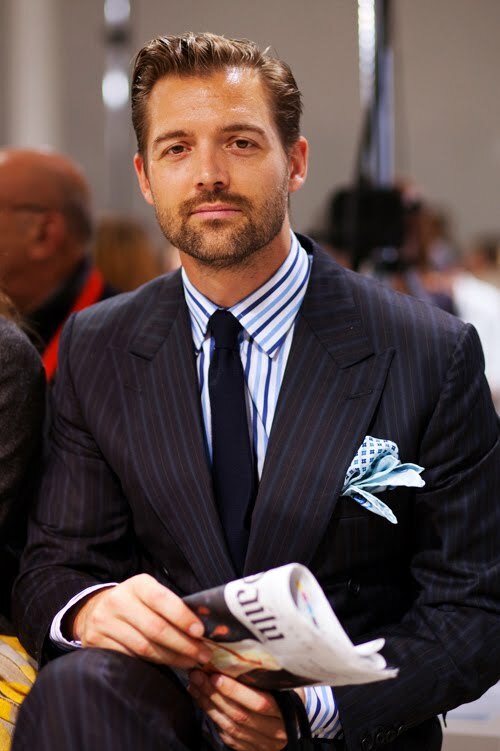 To finish on a positive note, a comment made to me by Patrick Grant at Norton & Sons: “More people are wearing handkerchiefs these days. Almost more than are wearing ties, which is really funny. You can follow the discussion on The handkerchief says ‘look at me’ by entering your email address in the box below. You will then receive an email every time a new comment is added. These will also contain a link to a page where you can stop the alerts, and remove all of your related data from the site. Its interesting I saw this article because have been trying to coax my man to wear a handkerchief but in vain. So I will gladly present this article to him. Like the article, Good job. I can’t say for sure, being as I wasn’t there, but I wonder if perchance you saw a hipster, or someone who was intentionally not interested in classic men’s clothing so much as just interested in subculture flamboyance drawing on classical elements. I could see the same description being applied to such a person equally as much as it could be applied to someone who was simply sloppy, or as you put it, naive. Couldn’t agree more. Recently, I almost exclusively wear the “TV fold white linen” in my breast pocket. Anything else feels too flashy for a suit, and I rarely wear sport jackets.